Multiple sizes to suit any detailing job! The Supreme 530 Microfiber Towel Trio includes three sizes of our 530 g/m², thick microfiber towels. No matter what the job or how big the vehicle, the Supreme 530 Microfiber Towel Trio has a towel to suit your detailing needs. The Supreme 530 Extra Large Microfiber Towel is soft enough to be a bath towel but tough enough to withstand any detailing job. The unique blend of 75% polyester and 25% polyamide gives the towel a balance of softness and toughness to perform any detailing task. Buff paint and dry your vehicle without worrying about towel-induced scratches. This huge towel is ideal for detailing large cars, trucks, and SUVs. All three Supreme 530 Microfiber Towels feel as soft as the finest chenille. They glide over the paint, grabbing dust and massaging the paint to a brilliant shine. The nap is deep enough to pull light dust and dirt away from the paint surface where it cannot scratch. The microfiber-covered hems and removable tags further ensure a swirl-free detail. 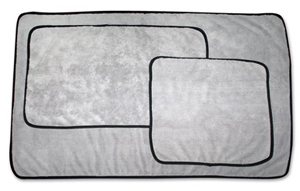 Collect all three sizes in the Supreme 530 Microfiber Towel Trio! A total retail value of $40.97. Save $10.98!